Voltage Regulator (or VR) valves are ingenious devices designed to maintain a constant voltage across their terminals over a range of currents. They are used for stabilising power supply rails, either on their own, for low current applications, or possibly as a voltage reference in an active regulator circuit employing a feedback mechanism and amplifying valves. VR tubes have a cold cathode and contain gases at low pressure rather than the conventional high vacuum used in amplifying valves. The internal gasses are deliberately chosen to ionise (conduct) at a particular predefined voltage and is this mechanism that provides the voltage regulation. Strictly speaking cold cathode VR tubes are not 'thermionic' devices because they do not use the thermal excitation of a hot cathode to instigate current flow as is the case with high vacuum or 'hard' valves. Common regulator valves provide regulation for voltages between about 75 and 150 volts. Higher voltages are possible by connecting devices in series. The common neon type power indicator is a gas discharge tube and will exhibit a relatively constant voltage characteristic once ionised. Note: most neon indicators are built with an integrated current limiting resistor in the assembly and these can not be used as a 'VR' type tube without modification. Regulator tubes are fundamentally 2 terminal devices although a few specific types have a third electrode that is connected, via a resistor, to a high voltage point and acts as a starting electrode. The internal electrode design of voltage regulator valves is asymmetrical and they are polarised devices. Your author has observed them glow when connected either way round, albeit probably with reduced lifetime and/or regulation when connected the 'wrong' way. Gas discharge tubes require some stimulus to initiate the ionisation process. Most of the data sheets for the types listed below specify a certain level of incident light that is required to ensure ignition at the stated voltage. The 150B2 data sheet I found gave two ignition voltages, one for a specified range of ambient light and another, higher voltage, for operation in total darkness. Note: Some older military parts have small internal radioactive sources to initiate ignition in total darkness! These valves are potentially highly dangerous and professional help should be sought if they are identified. These should be marked with the normal triangular radioactivity symbol. Regulator tubes are characterised by an operating voltage, an ignition voltage (generally about 10-30 volts higher than the operating voltage) and a range of operating currents over which the specified regulation is maintained. The combination of a resistor to a higher voltage point, a gas discharge tube and a parallel capacitor can form a 'relaxation oscillator'. This is an often demonstrated experiment with a neon tube but isn't recommended if you are trying to provide a stable power supply! The data sheets I looked at all specified a maximum decoupling capacitance to avoid the relaxation oscillator problem. If a larger capacity is required it should be connected to the regulated voltage via a series resistor. In time I hope to add some schematics showing VR tube use together with some example calculations. Below is a small (and not definitive) table showing the characteristics of 8 common VR tube types. The larger octal base types will take up to 40 mA although operation will often be at a lower current. Note: The octal types have an internal connection linking pins 3 and 7. This connection, and the multiple anode connections on most of the 7 pin types, is often utilised to connect the load to the VR tube anode and resistor to the higher voltage rail. If the VR tube is removed, the connection between the load and the high voltage supply is also removed protecting the load against the over voltage situation which might otherwise occur. 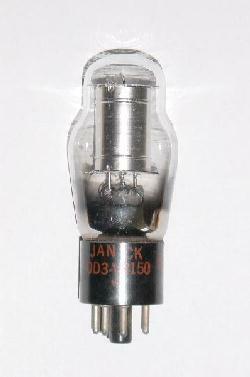 When operating, voltage regulator tubes emit a pleasant coloured glow; orange for lower voltage types (less than 100 volts) and pale purple for the higher voltage types. Some of the 7 pin sub miniature types I have (specifically the 150B2 and 85A2) are internally silvered to minimise the amount of light radiated but are still visibly illuminated when on. Recently I purchased a box of old octal base valves, most unboxed and some used. In amongst these were about 10 VR tubes; some VR150s, VR105s and a VR75. I had previously heard that old VR tubes can be way out of specification and after testing some of my batch I can confirm this. About half the VR105 tubes stabilised at about 120-130 volts although their regulation still appeared good. The performance of one of the VR150 tubes that did stand the test of time better is shown in a table below.